Sterling, VA and Peabody, MA (December 7, 2007) . . . Gammaflux LP and Synventive Molding Solutions have announced that they have reached a private label manufacturing agreement whereby Gammaflux will supply its LEC and TTC hot runner temperature control systems to Synventive. The agreement began December 5, which corresponded with the opening date of the Euromold exhibition in Frankfurt. "We are excited to be working with Synventive, who is one of the largest hot runner suppliers in the world," said David Huntting, President of Gammaflux. "They are a strong company with a leadership position in the automotive market and a well-earned reputation for excellent products. We feel that our temperature controllers will further enhance their product line and will be an attractive option for their customers." 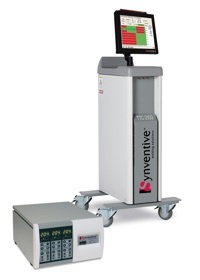 "For years Gammaflux has been known as the world´s leading supplier of hot runner temperature controllers," said Bill Hume, Synventive President – North America. "Their products are a perfect fit for our hot runner systems, and by offering them we are now providing our customers with even better solutions for their molding challenges." At the K 2007 show in Dusseldorf, Gammaflux announced its new 5-Year Warranty on all of its hot runner temperature control systems. The new warranty is believed to be the longest such warranty in the industry. It covers all of the company&acuete;s LEC and TTC temperature control products but excludes the touchscreen interface, which will continue to have a 2-year warranty. Synventive Molding Solutions is the plastics industry´s technological leader in hot runner systems. Since the 1970s, Synventive and its predecessors have served thousands of customers in the automotive, electronics, telecommunications, packaging, medical, consumer/industrial and PET industries. Today, with manufacturing in Asia, Europe and North America and service and support operations in more than 20 countries the company has grown to become the global leader in melt delivery and flow control technology. The company leads the industry with fast deliveries, providing both standard and custom hot runner systems in as little as two weeks.